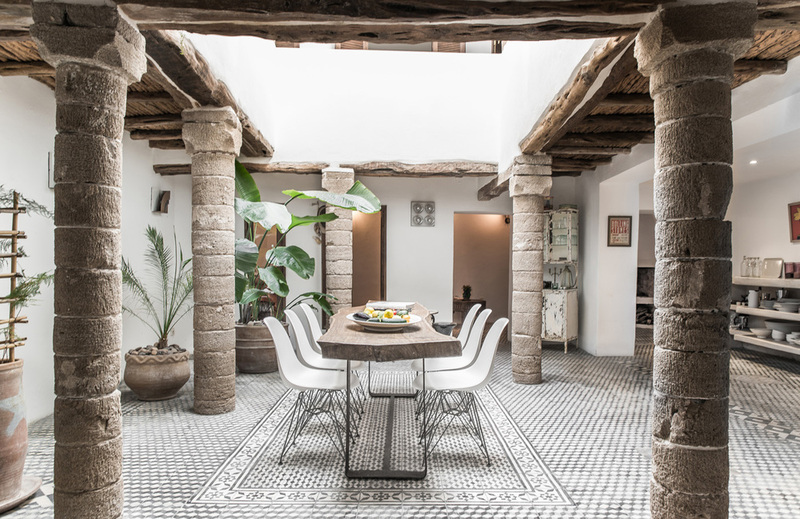 As you enter the house you will walk into the large, light-filled open plan courtyard with beautiful black and white tiled floor and large dining table handmade from a large slab of Eucalyptus wood and eight dining chairs. The open plan space leads to the kitchen which is fitted with all modern appliances, gas range cooker, fridge freezer and washing machine. The surfaces and shelves of the kitchen area are all sculpted and finished in Tadlakt which is the traditional coating of hammams in Morocco. You can enter the ground floor snug area from the kitchen and main courtyard area and here you will find a huge open fireplace stocked with wood, two large vintage armchairs and low tables.